The photo at the top of Danny Comeaux’s Facebook page, Comeaux proudly striking a victory pose above the sign for Mt. Katahdin, shows a man who is literally on top of the world. 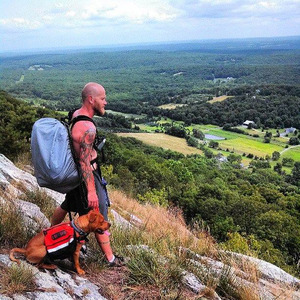 After training for six long months and quitting his job, Comeaux decided to set off on one of America’s great adventures — hiking the Appalachian Trail. And the 39-year-old Niles, Ill., resident had only one trail companion in mind — his loyal dog, American Pit Bull Terrier, Moose. Comeaux and Moose started their epic journey at Springer Mountain in northern Georgia’s Chattahoochee National Forest back on April 6. On September 5, an impressive 152 days later, the now-expert hikers finished their trek atop Maine’s Mount Katahdin — the official endpoint of the 2,200-mile long Appalachian Trail. Plagued by sad events in his childhood and by mistakes he made earlier in life, Comeaux needed to do something meaningful, he says. Determined to leave the dark parts of his past firmly behind him, Comeaux says he got the idea to hike the Appalachian Trail from a friend of his who’d completed the voyage himself. “I wanted to do something positive for myself, but also something my kids could see,” Comeaux tells the South Bend Tribune of the hike. Comeaux shares custody of his 15- and 9-year old sons, Dylan and Hausten, with their mothers. But Comeaux says had another important reason for embarking on such a big mission — to raise awareness about Pit Bulls. The much-maligned and much-misunderstood breed is often the target for breed discrimination, but Comeaux wanted the whole world to know Pitties are just as intelligent, sweet, courageous, and loving as other kinds of dogs. Moose, he says, is a shining example of just how wonderful Pit Bulls really are. “I wanted [Moose] to be that ambassador, to show that [Pit Bulls] can be amazing creatures, and he did a phenomenal job out there,” he explains. A phenomenal job indeed; Moose traversed the often-tricky trail with panache, carrying his own pack, swimming in the streams as the duo slowly made their way northward. Always outgoing, Moose managed to make plenty of friends on the AT, too. Together, Comeaux and Moose crossed paths with fellow hikers and wildlife alike. The pair of man and dog encountered bears, moose, snakes, and more during their ambitious hike. Though there were plenty of obstacles and challenges to tackle, Comeaux and Moose soldiered on while others on the trail didn’t. Comeaux says his and Moose’s hiking days are far from over. He’d like to perhaps try the Pacific Crest Trail next, then maybe the Continental Divide Trail, all with his canine companion by his side. If you’d like to learn more about Comeaux, Moose, and their amazing Appalachian Trail hike, follow them on their Facebook page, WeWillFinish.